Except for the period of Japanese American Exclusion during WWII, this is the oldest, most continuously farmed land in this region. Today, it is the last of the original family farms that at once made Bainbridge Island an strawberry capital of the Pacific Northwest, and the largest production farm in Kitsap County. Suyematsu Farm is the oldest, most continuously farmed land on Bainbridge Island, and possibly the larger Central Puget Sound Region. 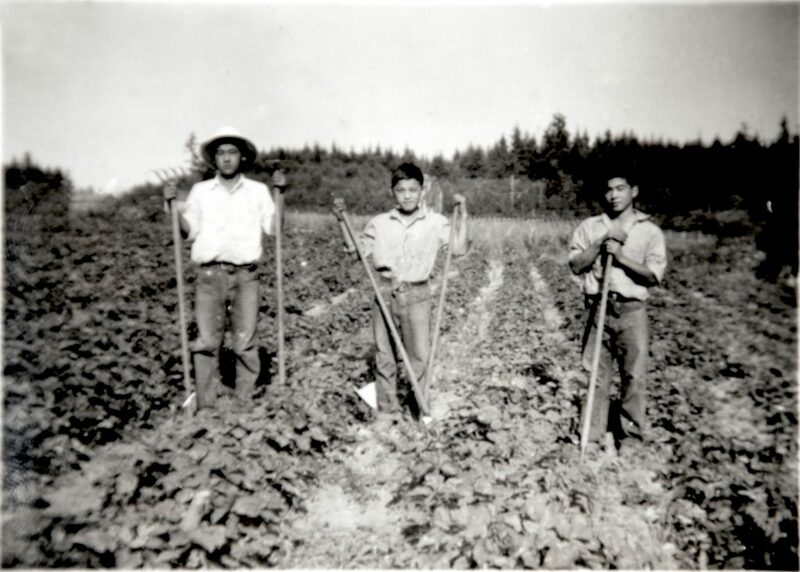 For 90 years, this has been one of the largest, and now the largest, production farm in Kitsap County, except for the period of Japanese American exclusion during WWII, when the Suyematsu’s we interned in the Manzanar and Minidoka concentration camps. They like most of the Bainbridge Island Japanese immigrants raised berries and during the period of 1930-40 put their farms and the Island on the map as the strawberry capital of the Pacific Northwest, famous for the Marshall variety they raised, which was known at the time as the finest tasting strawberry in the US. Yasuji and Mitsuo Suyematsu, immigrants from Japan, purchased this 40 acre property in 1928, after farming on rented land nearby for more than a decade. The Asian Exclusion Act prevented anyone who was not a naturalized citizen (born in the US) from owning land, voting or becoming a US citizen. The parent registered the land in the name of their eldest son, Akio, who was 8 years old at the time. The Suyematsu children eventually numbered seven, although their youngest son died at young age. Mostly by hand and horse, it took three decades for the Suyematsu family to transition this land from a forest into one of the original berry farms that made Bainbridge Island the strawberry capital of the Pacific Northwest. 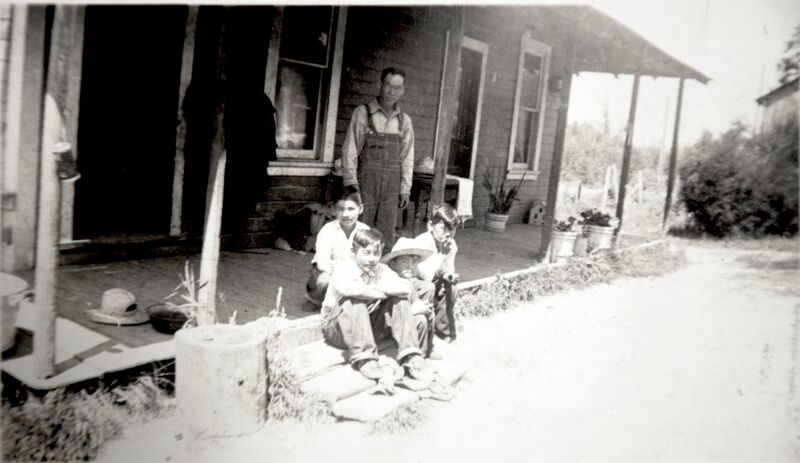 The Suyematsu’s were forced to leave their 40 acre property in March 1942, just before the harvest season, at what would have been one of the largest bumper crops they had ever seen. Unable to afford to hire a farm manager, the land was unkept for the duration of the war. 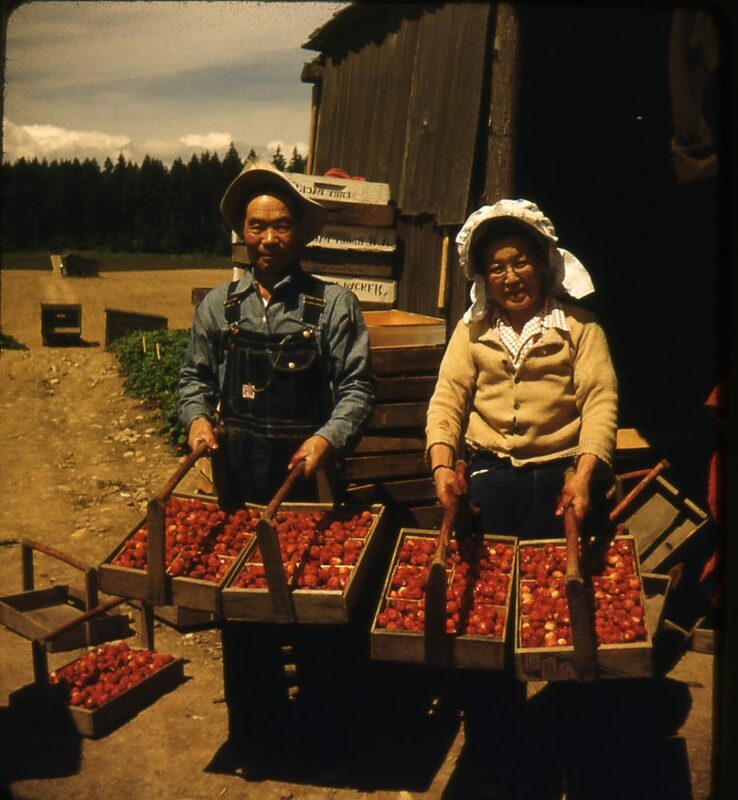 Upon returning to Bainbridge Island in between 1945-1947 (Akio and his brother Ish had been drafted by the US Army in 1944 while in concentration camp), the Suyematsu’s were among a quarter of the original strawberry farmers to reclaimed their farm land. Their eldest son, Akio, who passed away in 2012 at age 91, had been farming this land since childhood, was responsible for guiding this farm into this 21st century. Akio Suyematsu was the last of the original berry farmers on Bainbridge Island who put Bainbridge on the map as Island the strawberry capital of the Pacific Northwest. He was also one of the first Japanese Americans to be forcibly removed and incarcerated during WWII. 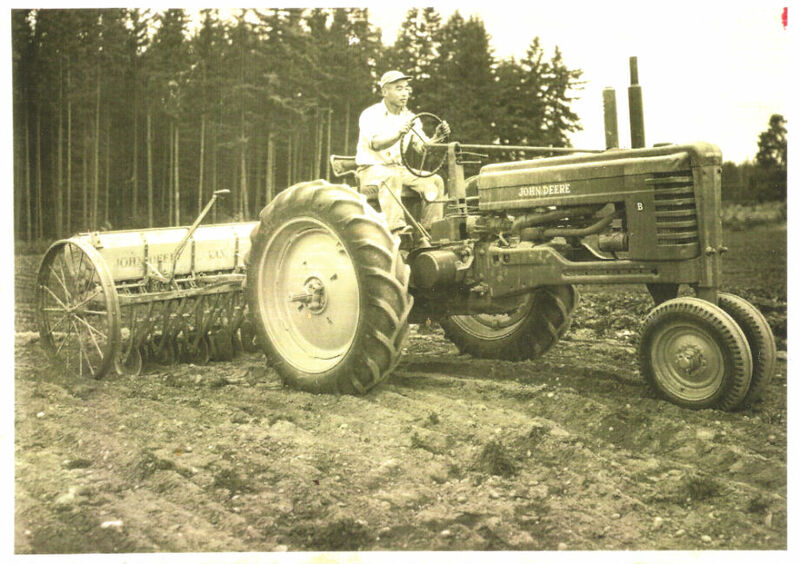 Upon his return to farming after WWII, Akio was named 1958 Kitsap Farmer of the Year. In the 1980’s, Suyematsu Farm was the first farmer on Bainbridge Island to begin a formal composting operation and the first farm to turn organic. 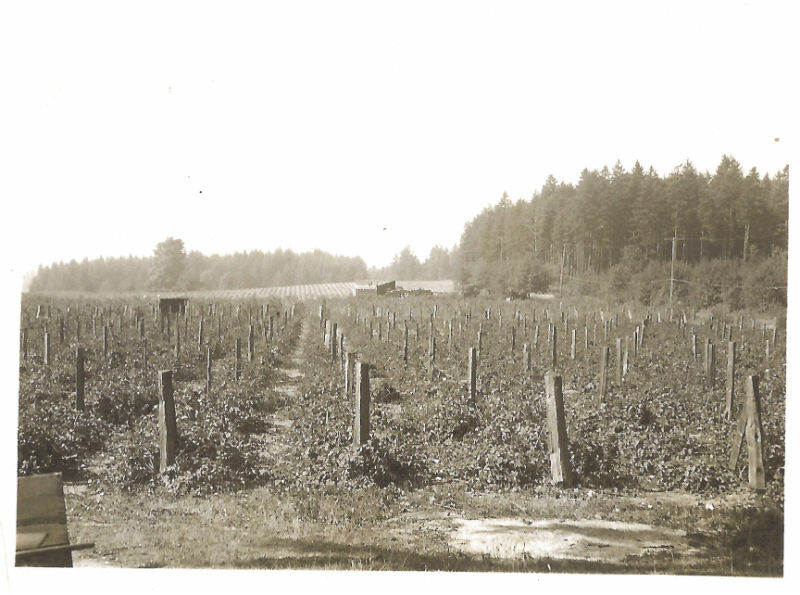 Starting in the late 70’s, the Bentryn family rented, then purchased, half of the farm to create Bainbridge Island Vineyards and Winery. 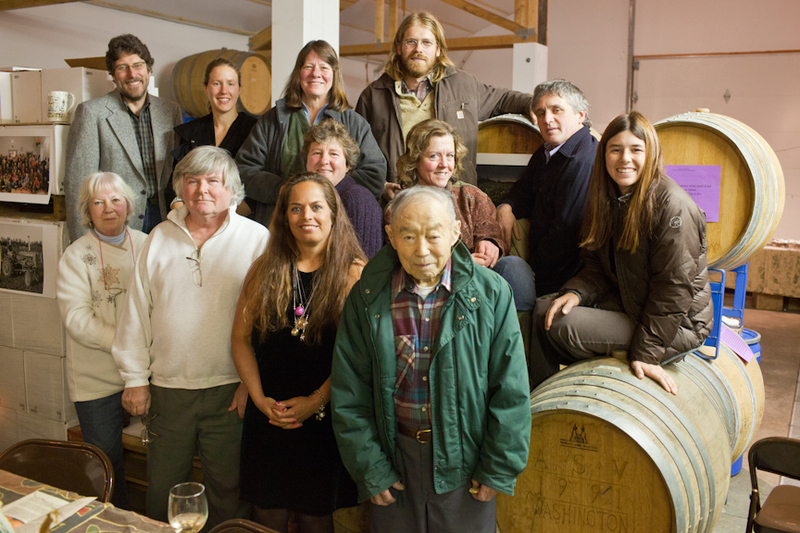 Akio Suyematsu and the Bentryns mentored the next generation of master farmers (Karen Selvar, Betsey Wittick, Brian MacWhorter, Mike Paulson, Carol Rolph, Mike Lempriere) who help farm their land and who also farm their own land on this 40 acres and elsewhere. 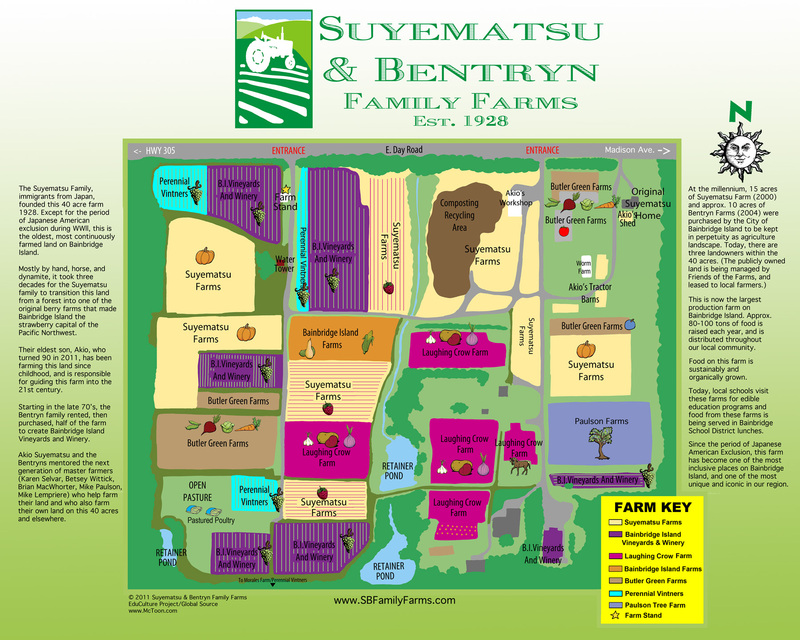 At the millennium, 15 acres of Suyematsu Farm (2000) and more than 10 acres of Bentryn Farm (2004) were purchased by the City of Bainbridge Island to be kept in perpetuity as agricultural landscape. Today, there are three landowners within the 40 acres. The publicly owned land is being managed by Friends of the Farms, and leased to local farmers. This is now the largest production farm on Bainbridge Island. Approx. 80-100 tons of food is raised each year, and is distributed throughout our local food community. Food on this farm is sustainably and organically grown. Today, local schools visit these farms for edible education programs and food from these farms is being served in Bainbridge School District lunches. Since the period of Japanese American Exclusion, this farm has become one of the most inclusive places on Bainbridge Island, and one of the most unique and iconic in our region. 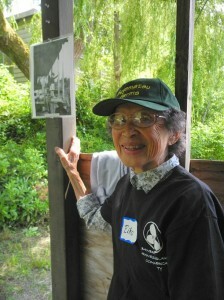 Eiko Suyematsu, the youngest daughter, standing on the front porch of her family homestead in 2013, under a photo of her as a child in the same spot in the 1930’s. 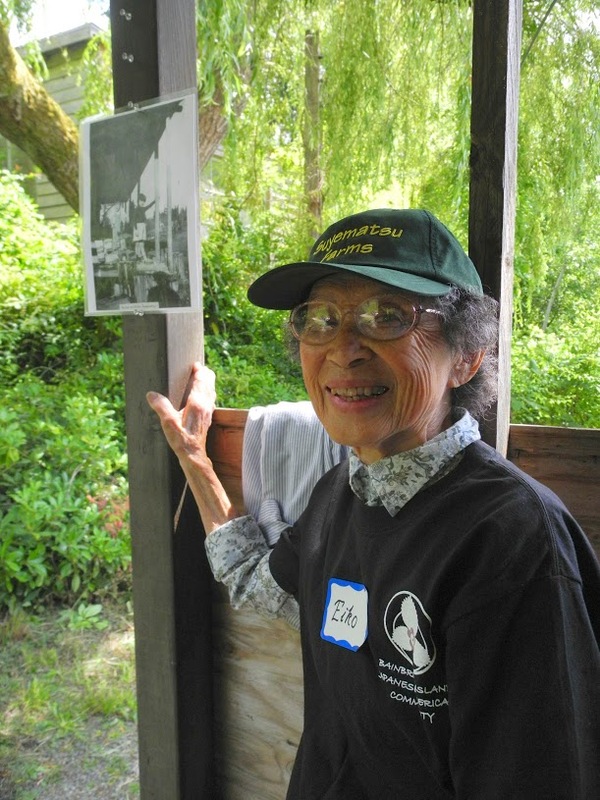 THANK YOU to the Suyematsu Family, Suyematsu & Bentryn Family Farmer’s Guild, City of Bainbridge Island, Friends of the Farms and other community partners for your tremendous collaboration and support of edible and heritage education on this historic site! Like others before us, The EduCulture Project got its start through the generosity of farmers like Akio Suyematsu who allowed their agricultural landscapes to be used as learning landscapes by hundreds of local school children. It has also become an OWWCC heritage site where hundreds of students, educators and adults come to visit each year to tour and learn about one man’s triumph over the adversity of exclusion, losing his freedom and his family farm, and returning to make Suyematsu Farm what it is today.